I sat across from the food and beverage director. It was 1993 and I was in my third interview for a server position in the Georgian Room, Four Seasons Hotel, Seattle. When you make it this far in the process, it’s hard to screw it up so I felt confident I had the job nailed. I looked him in the eye and said, “Overall, she would say I was a valuable employee; reliable and good at what I do. But there was one time I made a bad decision…” and I went on to tell him about the bad decision, why I did it, and regret it now. By the way, it was nothing illegal, and not relevant to the story so I won’t bore you with the detail. I got the job at the Four Seasons and didn’t give that interview another thought. I ended up working there for four years in a few of their outlets from The Georgian Room, to the Garden Room and even in banquets when I was lucky enough to work the APEC lunch where President Clinton gave this speech to many world leaders. One day, at an employee party, while chatting with that very food and beverage director, he told me the only reason I got the job was because I had been honest. It turns out, he had already known about the incident, and they weren’t going to hire me. This story came to mind as I listened to an interview of successful health and wellness coach, Meg Worden. Many years ago, Meg was incarcerated in federal prison, for two years. It took some real nerve for her to share this as part of her story, but she does. It’s on her about page; it’s part of who she is now. Imagine if she didn’t share that. Imagine if you hired Meg as your coach, and found out later that she is an ex-con. That’s a pretty different scenario than being totally up front about it, isn’t it? In fact, I’m more likely to hire her because of it, rather than despite it. What a fascinating story; and how cool is it that she turned her life around? Wouldn’t that more than likely make her an even more powerful coach? 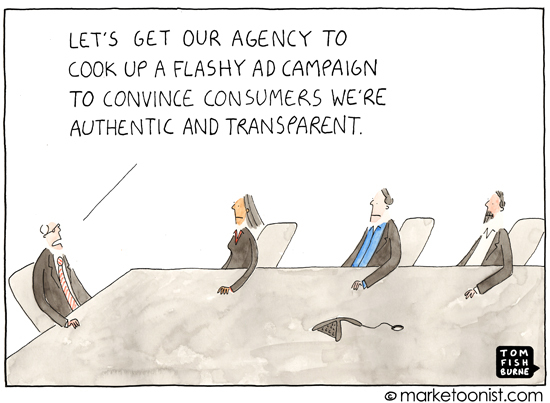 Transparency is pretty refreshing, isn’t it? Properly managed expectations will net you far better results than the opposite, which just get you disappointed, often angry customers. And I don’t have to tell you those angry and disappointed customers now have a louder voice than they did years ago. Your hotel might have the best location, and offer the best experience in town, but your rooms could use some updating. Don’t hide the fact. Let people know so they can be empowered to make the decision based on what is important to them. Your technology might be good, on it’s way to great. Talk about what is good, and what will make it better. Talking about our weaknesses is hard. We are far more forgiving when we feel you as a brand have been up front about the skeletons in the closet. Don’t shy away from the tough questions. If someone asks, look down at the floor if you must, find the clarity, and have the presence of mind to bare your soul and show those faults and blemishes. Perfect people and perfect brands are boring. Want to tell a better story? Share the good, the bad, and especially the ugly. By the way, my husband just read this and said he wished he had known I almost got fired and non-hired before we got married. Sigh. 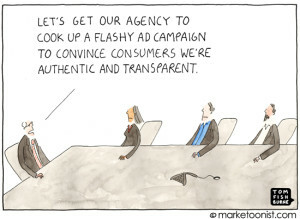 Photo credit: or rather, cartoon credit: Tom Fishburne, the marketoonist. Great stuff, Lisa. Like you say, honesty/transparency, call it what you will, is always the best policy. You don’t have to give all the details, but at least make sure you’re not hiding the details. Is it bad that I’m fixated on knowing what the incident was? Yes. It’s really bad you are fixated on it. It’s a total 20 something douchebaggery move. I was a supervisor level waiter in room service. It was off season and my friend and I wanted to see the ocean because there are no bodies of water near Aspen and I was in need of looking at water. So we decided to go to Laguna Beach. I covered my shifts, but with regular peon waiters, not supervisors. When I got back I was in big big trouble. I think they would have fired me but I was actually a really good employee, so they only suspended me for three days (So I went mountain biking in Moab). I returned to work and was my usual model self. It was a bad decision. And I never did it again. I was thinking that was the end of it, but when the food and beverage guy asked me about my job performance, I had a feeling honesty was going to be a good policy. That’s a great story. And much better than the one I imagined. In my version, you were cooking meth in an RV out in the desert.